A photoshopped image of Ted Cruz in boxing clothes. 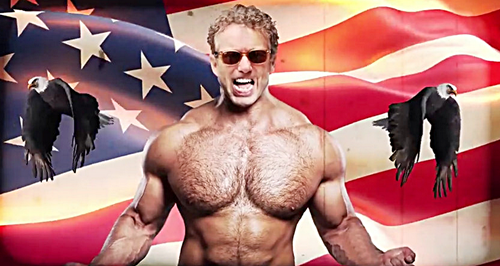 Another image of a shirtless and brawny Rand Paul. And lots of fire-breathing bald eagles. America’s Liberty PAC — a pro-Paul super PAC — is releasing a five-figure digital ad buy over the weekend, featuring a WWE-style video that promotes a rare gathering of the U.S. Senate this Sunday to debate the Patriot Act just as key provisions of the law are set to expire. “Sunday, Sunday, Sunday,” the juiced-up narrator says, previewing what the PAC is calling a “brawl for liberty” on the Senate floor. The video goes after Cruz, calling him a “capitulating Canadian,” a likely reference to Cruz’s support for legislation that would tweak the NSA domestic phone surveillance program but still reauthorizes portions of the Patriot Act. 2016 elections : advertising Liberty Pak LOL loser OMFG Rand Paul Rand Paul Beefcake WTF?